Dec 12, 2017 - "Today, we released security updates to provide additional protections against malicious attackers. By default, Windows 10 receives these updates automatically..."
- Microsoft Malware Protection Engine..."
Dec 12, 2017 - "... This month, there are -9- security updates and 30 non-security updates. All of the security and non-security updates are listed in KB article 4055454*. A new version of Office 2010 Click-To-Run is available: 14.0.7191.5000 ..."
"... Patch reliability is unclear. Unless you have an immediate, pressing need to install a specific patch, don't do it..."
Microsoft released security updates for all versions of Windows the company supports (client and server). No critical updates for Windows, but for IE and Edge. Other Microsoft products with security updates are: Microsoft Office, Microsoft Exchange Server, Microsoft Edge and Internet Explorer. Microsoft Edge: 13 vulnerabilities, 12 critical, 1 important..."
Dec 12, 2017 - "This December Patch Tuesday is considerably lighter than last month’s patch releases. While only three of the fixes were for Windows operating system, the majority of the vulnerabilities to pay attention to are Browser/Scripting Engine based. For an overview, we show fixes for 32 unique CVEs addressed, with 19 Critical, and 24 addressing remote code execution at varying severity levels. No active exploits are listed by Microsoft again this month. From a prioritization standpoint, again we turn our focus to the browsers and the Scripting Engine Memory Corruption Vulnerabilities. We recommend prioritizing patching for user facing workstations to address the 19 Critical Internet Explorer and Edge updates released today by Microsoft, as they are listed as “Exploitation More Likely”. There are no known exploits as of yet, but this is an opportunity to remain ahead of any future exploits that may be released. There is one Windows OS vulnerability that should be reviewed, and that is the fix for CVE-2017-1885, which is a Remote Code Execution using RPC on systems that have RRAS enabled. Make sure you are patching systems that are using RRAS, and ensure it is not enabled on systems that do not require it, as disabling RRAS will protect against the vulnerability. For that reason it is listed as Exploitation less likely, but should get your attention after patching the browsers. Additionally, we recommend you take some time to review ADV170021, a Defense-in-Depth update that has configuration options to allow you to exert more control over DDE behaviors, in light of the recent DDE exploits that have been publicized. Note that this configuration change would be made after installing the update referenced in the advisory. It should also be noted that on December 7, Microsoft released an out-of-band emergency patch for CVE-2017-11937 and CVE-2017-11940, which was a flaw in the Microsoft Malware Protection engine that could allow an attacker to create a specially crafted file that would be scanned by the Malware Protection engine, allowing for code execution on the endpoint. The patch was automatically ingested by the affected engines via definition updates, so no action should be required. As a precautionary measure, if you are using Microsoft’s Malware Protection engine in Defender, Security Essentials, Forefront Endpoint Protection, or the engines in Exchange 2013 or 2016, ensure that your updates are being applied automatically, and that you are on at least Version 1.1.14405.2 of the Malware Protection Engine. From the Adobe side, there was only one Flash update, APSB17-42 listed as a “Business Logic Error”. So all in all, a rather quiet end to a busy year in vulnerabilities..."
Edited by AplusWebMaster, 13 December 2017 - 05:26 AM. ... The 64-bit security-only for July was just 30MB and the 32-bit was an even smaller 19MB, compared to the same month's rollups of 194MB and 119MB. The differences in December were even starker: 900KB and 1.4MB for the 32- and 64-bit security only updates, respectively, and 125.1MB and 204.7MB for the rollups. 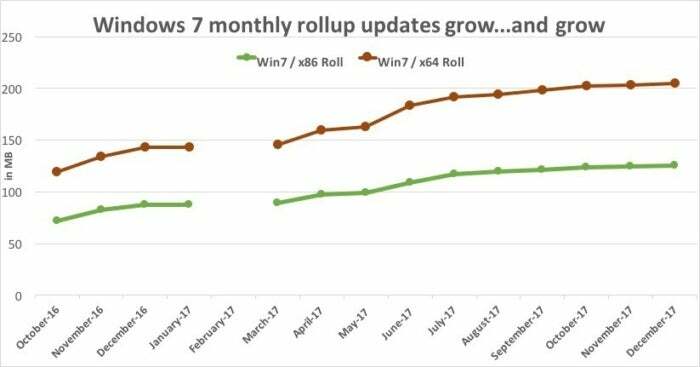 The rollups are larger not only because they drag their past with them - each succeeding rollup includes that month's patches as well as all previous patches back to October 2016 - but because they also include non-security bug fixes. Usually, though not always, issued later in each month, the non-security updates are bundled with the security patches, adding to the size of the rollup..."
Edited by AplusWebMaster, 14 December 2017 - 08:33 AM. This update is available through Windows Update*. 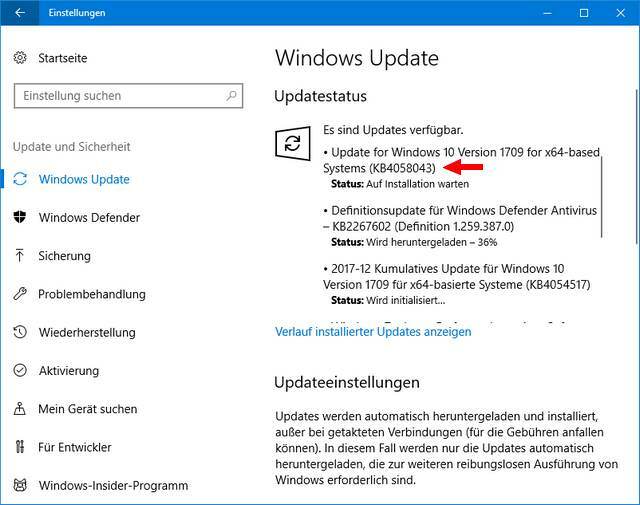 When you turn on automatic updating, this update will be downloaded and installed automatically..."
2017-12-16 - "... Microsoft has released another (reliability) update KB4058043 for Windows 10 Fall Creators Update on December 15, 2017. Here are some hints for this (reliability) update... Unfortunately they don’t tell us in detail, which app update error(code) has been fixed..."
Dec 18, 2017 - "Some subset of users of Windows 10 Fall Creators Update, version 1709, report persistent bugs with this month’s Patch Tuesday missive, KB 4054517. Many of those reporting problems are using recent Surface devices. Microsoft has not acknowledged any problems... doesn’t seem to explain all of the problems that people are encountering, but it may account for some. Microsoft, as usual, has not confirmed the problem and the persistent “advice” is to Reset or reinstall Windows — a process that’s been shown, time and time again, to be ineffective. No, the Windows Update Troubleshooter doesn't work either." "... Microsoft is not currently aware of any issues with this update..."
Edited by AplusWebMaster, 18 December 2017 - 03:47 PM. "... Windows Update History reports that KB4054517 failed to install because of Error 0x80070643. Even though the update was successfully installed, Windows Update incorrectly reports that the update failed to install. To verify the installation, select the Check for Updates button to confirm that there are no additional updates available. You can also type 'About your PC' in the Search box on your taskbar to confirm that your device is using OS Build 16299.15. Microsoft is working on a resolution and will provide an update in an upcoming release." Also see: "Known issues in this update..."
Dec 21, 2017 - "Update on these bugs and two more — an Excel 2016 security patch bug from last month, and an Exchange Server security patch bug from this month..."
14 Dec 2017 - "After installation of the December KB4054518 (Monthly Rollup), opening Office documents from a encrypted fileshare is broken..."
Edited by AplusWebMaster, 22 December 2017 - 07:01 AM. Known issues in this update: Microsoft is not currently aware of any issues with this update..."
"... Microsoft is working on a resolution and will provide an update in an upcoming release..."
See: "Known issues in this update..."
Edited by AplusWebMaster, 28 December 2017 - 02:57 PM.